Saturday, December 1, 2018. Parade starts promptly at 11:00 AM and ends at 1:00 PM and takes place rain or shine. For all your questions and parade FAQ's, click here. The parade is downtown Los Gatos. The route starts at North Santa Cruz Ave. and Almendra Ave. and continues along Santa Cruz Ave. to Main Street and ends close to Los Gatos High School. To see the parade route, parking, staging, and street closures, click here. A free bike valet service is available for parade participants and spectators from 7:30 a.m. until 2:00 p.m. at Municipal Lot #1 (Highway 9 between Village Lane and University Avenue, behind Hult's Restaurant). Sponsored by the Town's Bicycle and Pedestrian Advisory Commission, the service allows you the convenience and security of leaving your bikes, scooters, or strollers with our volunteers while you enjoy the parade. Help reduce traffic and avoid the parking hassles by riding your bike to the parade! The 62nd annual Los Gatos Children's Holiday Parade. The pride of Los Gatos. The parade starts at 11 AM on Saturday, December 1st. The parade route starts by the Bank of America on Santa Cruz Ave. and ends before Los Gatos High School on Main St. This is an exciting fun day for family, kids, and friends. Stake out your curbside seat early in the day. The parade features over 230 entries. 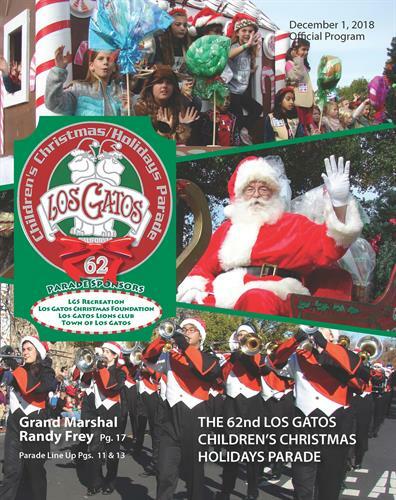 This year's Grand Marshal of the Los Gatos Children’s Christmas/Holidays Parade is long time resident, Randy Frey. Randy is being honored for his significant contributions for volunteer efforts with the youth of our community! The parade is held rain or shine. Click hear for parade FAQ's, map, parking and bike valet and street closures.